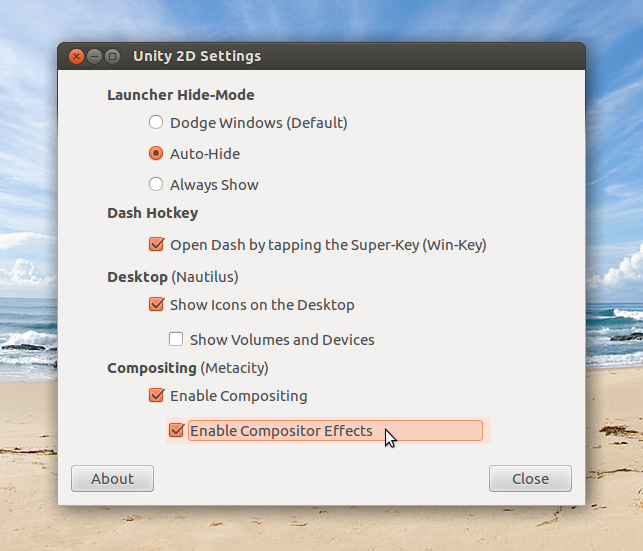 At the time of the release of Ubuntu Natty 11.04, Mariano Chavero has developed a simple GUI for changing the few available settings of Unity 2D, as well as some other desktop features. 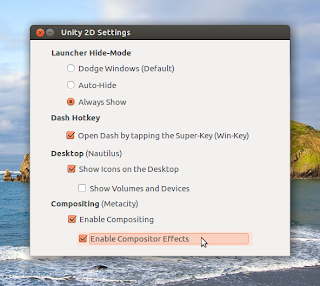 These settings could also be changed via GConf-Editor in Natty, or via DConf-Editor in Oneiric/Precise. But, you might guess it already :P , it's way easier to do that via a simple, dedicated GUI. I've finally taken the plunge to consolidate both the placement of the widgets and the sizing of the window, so now the GUI looks great no matter what fonts and font sizes are used. I've also added "About" and "Close" buttons and in turn removed the entire menu, as these were the sole items of it, improving both the GUI's usability and consistency, whether Global Menu is being used or not. Once installed, search the Dash for "Unity 2D Settings", or if you are running Unity 2D in a classic Gnome session, you'll find it under "System > Preferences". Other than that, everything is pretty self-explanatory. 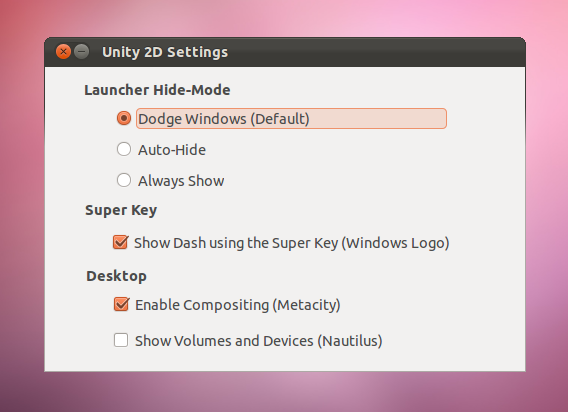 Notes: In Natty/Oneiric, when you set the Unity Launcher to "Dodge Windows", you need to either just relogin, or restart its process - via the Alt+F2 dialog, run "killall unity-2d-launcher"; if it fails to restart automatically, just run "unity-2d-launcher". When you change any Metacity settings, it seems to be a matter of luck if they are applied immediately, cause Metacity to crash and possibly restart, or none of both, plus possible weird side-effects; so be prepared to have to either relogin, or run "metacity --replace" via the Alt+F2 dialog. In Precise (as of now - Beta 1), any changes to the Launcher hide-mode are applied 'on the fly'; and when you change any Metacity settings, just opening the Dash would trigger their application, whether or not with an intermittent crash of Metacity; but if something nasty happens reg. the latter, just relogin. As Unity 2D has shifted to using DConf for its settings, Mariano's version doesn't work with Oneiric, and he hasn't released an Oneiric version yet. So I've modified his script to work with Oneiric, and also removed the session dependency - which was actually a nice idea/implemention, but turned out to be hindering if you are not running the session that is specified in the script, I mean literally. For the full changelog, please see below. Notice, however, that you might find yourself limited to using either the default 48px or 32px. That's because the icons of some applications, particularly LibreOffice, might not be scalable to any other size in between those. 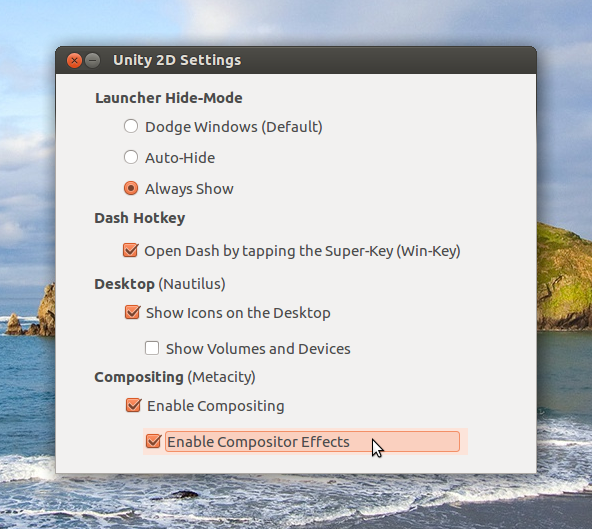 And for me, 32px is quite too small, even though it's kinda commonly used already with the regular Unity. Also, directly changing program files obviously has quite a few downsides - such as that the changes will be reverted by an update of the respective package, the changes are system-wide, and the program files are subject of change. Because of that, compounded by the icon scaling issue, I won't include it in the GUI tool for now. But downloading and running the script is for sure easy enough already!